St. Lucie West is minutes from beaches, theaters, museums, baseball, outdoor markets, and parks.We have plenty of shopping and restaurants minutes from the Resort. Check out the Local Area Guide tab for more information. You will find activities and attractions for you and your significant other & your entire family. 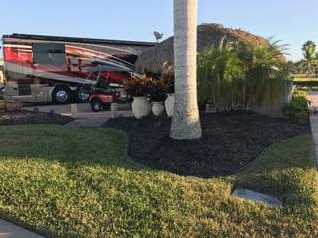 So what are you waiting for, book online today and get out and Enjoy a Motorcoach Resort St. Lucie West Vacation! 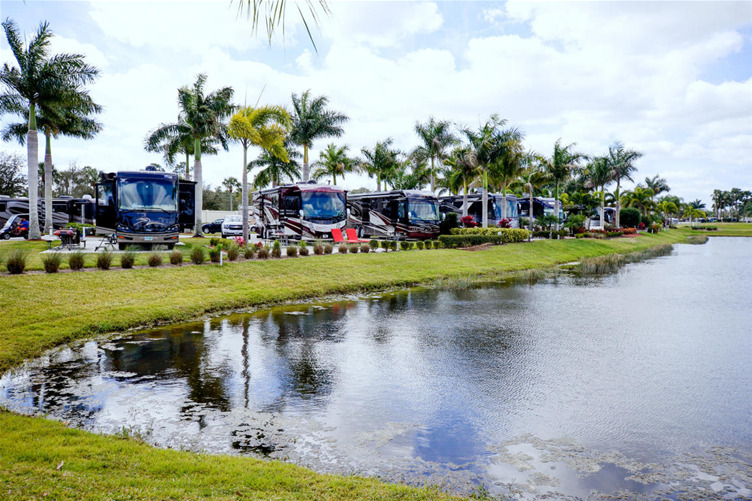 We know what it takes to run a successful Luxury Class A Motorcoach Resort. The beautiful tropical setting, combined with quality customer service is what sets us apart from the rest. Whether your visiting for a night or a Season you will not be disappointed. A true Luxury Class-A Motorcoach Resort, offering luxury sites, many with Tiki huts, outdoor kitchens and patios. Our new Phase 3 development includes large executive sites overlooking the lake, golf course and waterfalls. Enjoy your motorcoach lifestyle in a 1,000 sf coach house with luxurious indoor and outdoor appointments. Savannas offers camping, canoeing, kayaking and is located on a 550-acre wetland preserve. Sites are large, but not cramped. Beautiful natural Florida setting with abundant wildlife. An observation tower overlooks the Savannas wetland. On-site canoe and kayak rentals. Take your pick from RV, tent, wilderness and group sites available. Open year-round. 55+ MH & RV resort with nature walk around the lake offering level concrete sites with W/E/S, Wi-Fi/cable, laundry and clubhouse. Pet friendly (some restrictions apply). Nearby golf, shopping, medical center, civic center, beaches, restaurants and the Mets™ spring training camp. Call for reservations. We look forward to your visit. Nestled in a 38-acre Florida hammock close to beaches and fishing. Great park offering full hookup sites with concrete patios and picnic tables, rental villas, heated pool, tennis, basketball, shuffleboard, horseshoes, petanque, 3-hole golf course, campfire facilities, bathhouses, laundromat, clubhouses, activities, supply store and a restaurant. 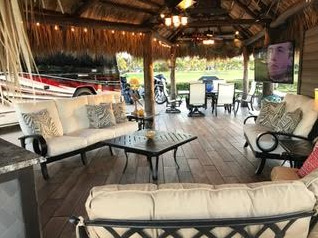 This premiere, age-qualified RV resort offers waterfront living and a lifestyle that will let you pursue your passions and discover some new ones along the way! Located on 45-acres of intracoastal waterway on the Treasure Coast, guests have exclusive access to a world of social activities, classes, outdoor recreations and planned activities! Our amenities include 24 electric sites with 50 amp service and water hookups and 35 primitive sites; all equipped with picnic table and fire ring. We offer, for your use, a fishing pier, boat ramp, overnight dockage, playground, restrooms and hot showers, laundry facilities, picnic pavilions, waterfront boardwalks and dump station. Private waterfront resort accommodating MHs, fifth wheels and travel trailers. Enjoy fishing, boating and bird watching on the Rim Canal. Offering paved roads, beautiful landscaping, brick paver pads, pool and waterfront Chickee Hut. A short distance from shopping, golf, restaurants and beaches. Escape the crowds and visit our paradise. Minutes to the beach, fishing, boating, golf and Dickinson Park. Walk or bike to restaurants, stores, bank, post office and library. Paved sites, on-site management and handyman, W/E/S, 30/50 amp service, cable and telephone available. Laundry, activities and community room. Join us, escape and enjoy sunny South Florida now! 55+ (21 to 54 welcome). Waterfront on Taylor Creek, 300 yards from Lake Okeechobee. Heated and screened pool, sundeck, laundromat, bathhouse with showers, rec hall, library, billiards, darts, planned activities, boat ramp, docks, boat trailer storage (fee), horseshoes, shuffleboard courts and free Wi-Fi. Pets allowed (breed restrictions). The largest KOA with a golf course. Okeechobee KOA is just minutes from famous Lake Okeechobee, known for its world-class bass fishing. 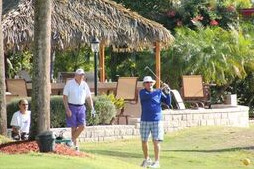 This campground features a palm-fringed 9-hole golf course, driving range and putting green. 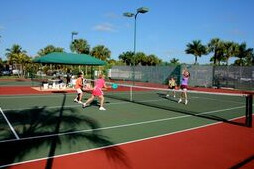 Play tennis on one of our four courts, work out at the fitness center or just soak in the pool. One pool for families, another for kids and a third for adults only. Minutes to the beaches. Home of the St. Louis Cardinals™ and the Forida Marlins™ spring training camps. Palm Beach Speedway®, fishing, golf, dining, malls and canoeing are all nearby. We are a gated park with concrete pads/patio, paved roads, 30/50 amp service, Wi-Fi/cable, propane, showers, laundry, fishing pond, convienence store, dump station, heated pool, RV rentals and seasonal activities.